At the end of the day I always like to close the open applications to prepare my computer for the next day. Since I rarely reboot my desktop, I manually close each application. Depending on the number of open applications this can be a waste of time. The people at NTWind Software have a perfect utility for this situation aptly called Close All Windows. Instead of manually closing each application just click the Close All Windows button on your taskbar. In this article I will show you how to install and configure Close All Windows on your computer for easy access on the taskbar. To get started head over to NTWind Software and download the latest version of Close All Windows. After the file is downloaded extract the CloseAll folder to a permanent location on your computer. Since Close All Windows is an application I extracted the folder to C:\Program Files\ where applications are typically installed. For easy access it is best to pin the application to the taskbar. 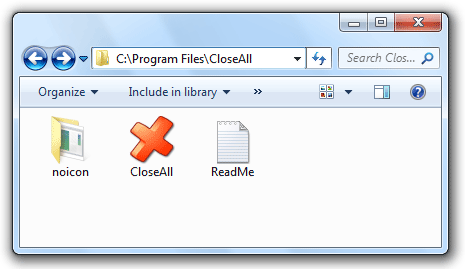 Drag the Close All Windows application from the CloseAll folder onto the taskbar. Congratulations, you are now more efficient.